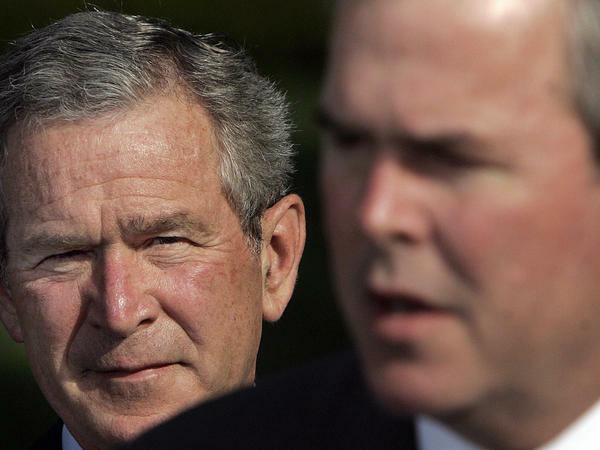 Former President George W. Bush, seen here in 2006 with his brother Jeb Bush in the foreground, has largely shied away from political activity since he left office. "President Bush has been incredibly supportive of his brother's campaign and Governor Bush is excited to have him out on the trail," said Kristy Campbell, a spokeswoman with the Jeb Bush campaign, via email. "With the threats facing our nation and our allies, we need a steady hand. Few people understand that better than President Bush who knows that we need a tested, strong leader as our next commander-in-chief." South Carolina is a hugely important state for the younger Bush, who currently trails four of his Republican rivals in the delegate count. But, it's also a state where he feels he has a chance to steer his sputtering ship back in line. His brother handily defeated John McCain in the 2000 South Carolina primary, which allowed him to solidify support and eventually secure the Republican nomination. So although early in race Jeb Bush was reluctant to use his last name — using "Jeb!" on campaign signs — these days, he's doesn't seem as shy about those family ties. His campaign is also airing a new radio ad in South Carolina, in which George W. makes the case that his brother is the most qualified candidate to become commander-in-chief. "We live in troubled times with the military deployed around the world," the former president says in the ad as dramatic music plays behind his voice. "We need a strong leader with experience, ideas and resolve. There's no doubt in my mind that Jeb Bush will be a great commander-in-chief for our military." George W. Bush is still thought to be popular in the state, especially in the low country, where there are strong military ties. It's a region where Jeb Bush needs to perform well. But, bringing out the 43rd president to campaign is a bit of a political gamble. Voters have not seen him on the trail in years. George W. Bush has largely shied away from political activity; he didn't engage in the 2008 and 2012 elections. He has appeared at private fundraisers for Jeb Bush's campaign, and has sat for occasional interviews, including a conversation with NPR in 2014. But Monday night's rally will be the most high-profile public campaign event for the former president since he left office in 2009.